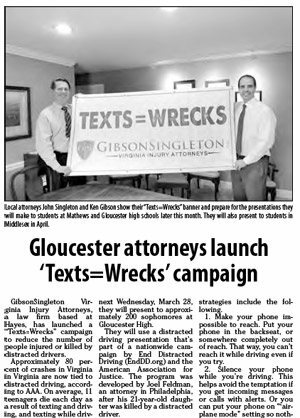 John Singleton and Ken Gibson kick off their "Texts = Wrecks" campaign in the Gazette-Journal. 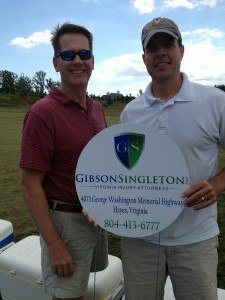 From January 2018 through May 2018, the firm reached out to the community, giving presentations to students at Mathews, Gloucester, and Middlesex high schools, to prevent senseless distracted driving accidents. 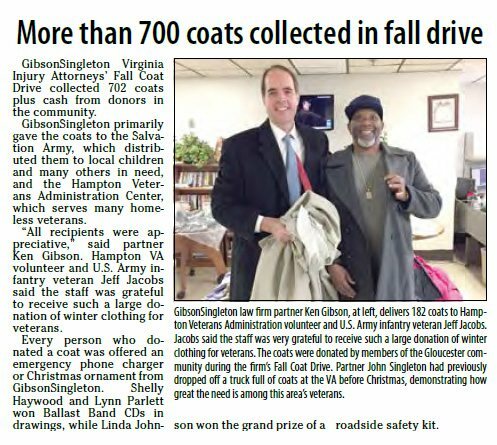 Ken Gibson delivers coats to U.S. Army veteran Jeff Jacobs of the Hampton Veterans Administration Center. 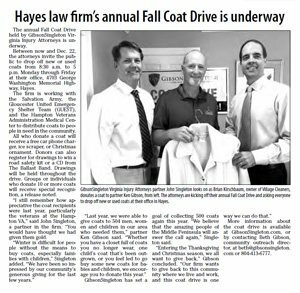 The Gloucester Mathews Gazette-Journal featured the firm for its 2017 Fall Coat Drive, which netted 702 coats and generous money donations for Middle Peninsula residents in need. 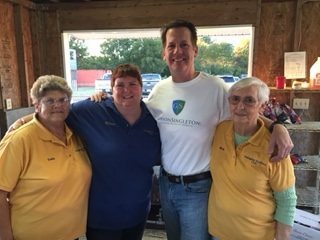 John Singleton and Ken Gibson thank fellow Eastern Virginia community members who donated to their annual Fall Coat Drive for 2017. 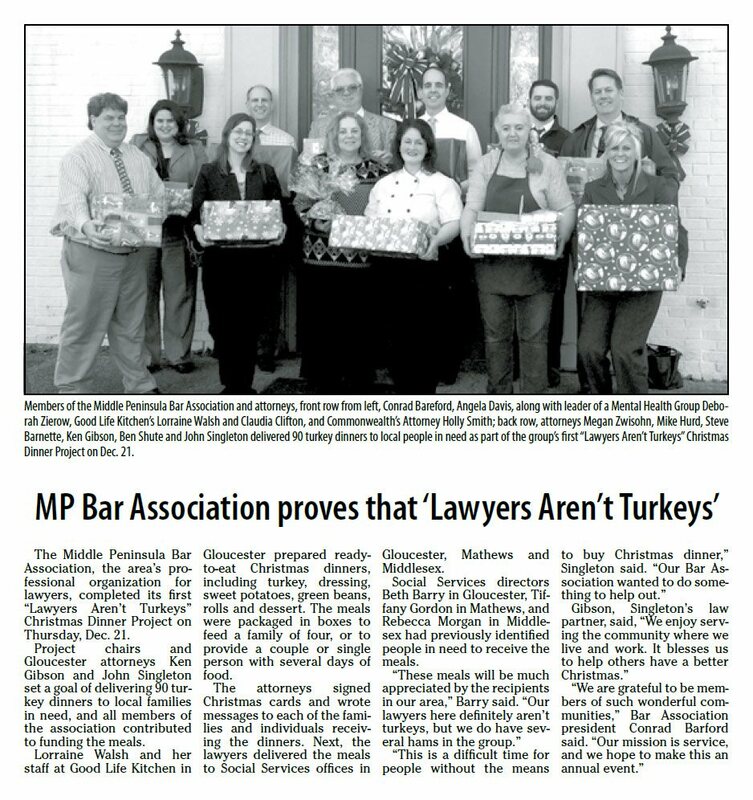 John Singleton and Ken Gibson, with the help of the Middle Peninsula Bar Association and local Social Services offices, distribute turkey dinners to 90 families in need for the 2017 holiday season. 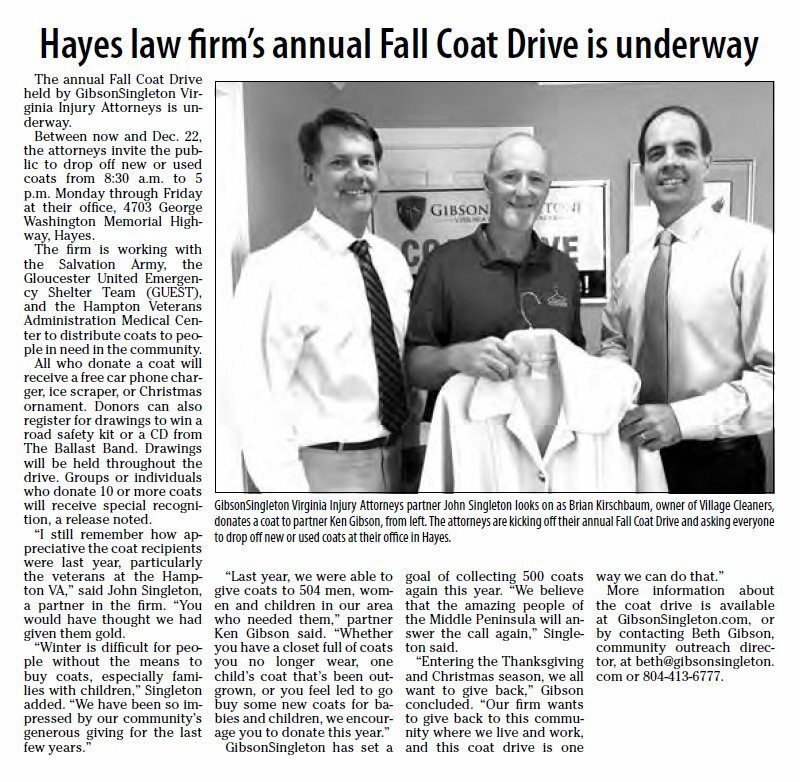 John Singleton and Ken Gibson featured in the Gloucester Mathews Gazette-Journal for their annual Fall Coat Drive. 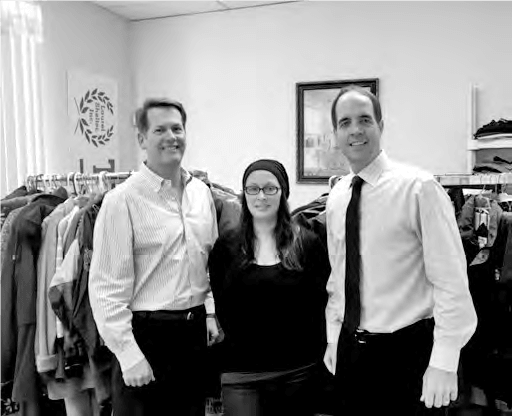 Every year, the firm gathers new and used coats to donate to people in need, in keeping with their strong commitment to serve their community. 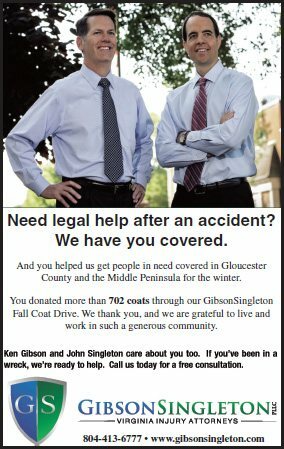 John Singleton and Ken Gibson thank Jenn Fuqua, case worker for the Gloucester Center of The Salvation Army, for her help with GibsonSingleton Virginia Injury Attorneys’ first Coat Drive. The firm collected more than 450 coats from generous donors in our community, and The Salvation Army is working hard to finish distributing them to those in need. 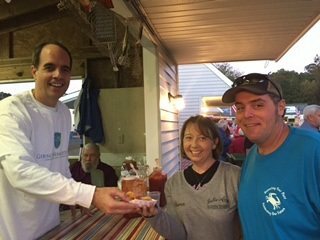 John Singleton and Ken Gibson serve others, sponsor booth at the Abingdon Ruritan Club Seafood Festival in Gloucester to help raise money for more than 40 nonprofit organizations. 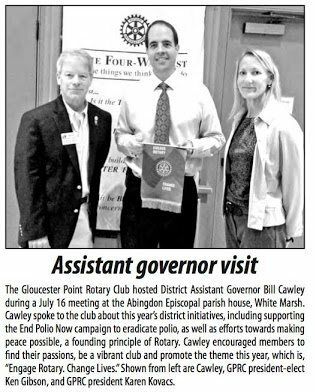 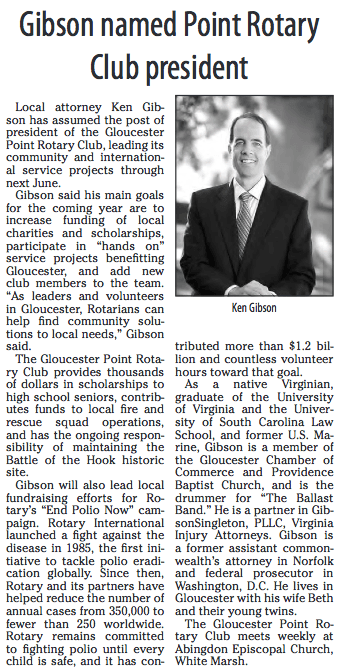 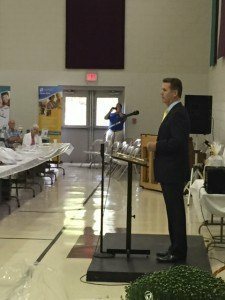 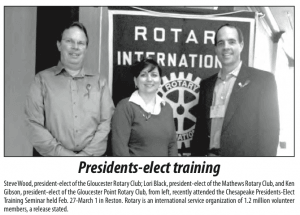 Ken Gibson serves as President of the Gloucester Point Rotary Club. 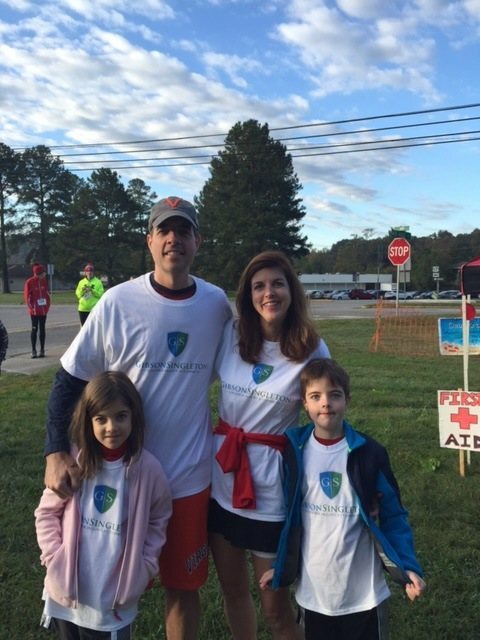 GibsonSingleton Virginia Injury Attorneys is enthusiastic to support the work of Rotary in improving lives, both locally and globally. 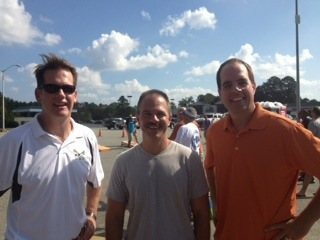 John Singleton and Ken Gibson visit with Gloucester Sheriff Darrell Warren at the Gloucester Deputies for Education Corn Hole Tournament. John Singleton and Ken Gibson sponsor and volunteer at the Gloucester Point Rotary Golf tournament. They believe in giving back to their community and beyond. 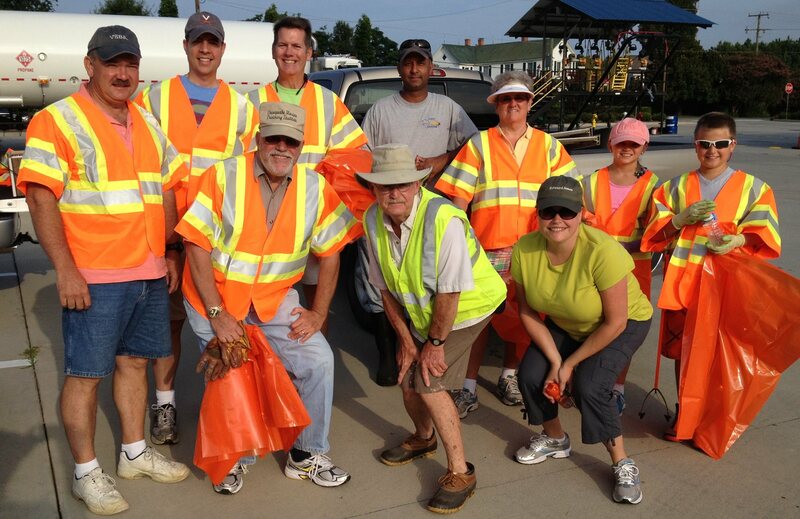 Ken Gibson and John Singleton join fellow Gloucester Point Rotary Club members in cleaning up Hayes Road and the Battle of the Hook site. 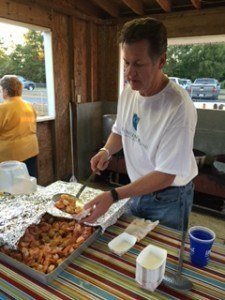 Both partners enjoy volunteering, and their work helps clients because they develop strong ties throughout our community.